Burlington, get ready for some offbeat entertainment. For the second year, the Off Center for the Dramatic Arts is throwing a Spring Open Artist Showcase. The four distinctively different acts featured are lucky ducks — and not just because they don't have to pay to play. "In March, we literally pulled names out of a fishbowl at the Light Club Lamp Shop," says Off Center director Laura Roald. "We do it this way in order to make it as open as possible." As an additional incentive for emerging talent, she notes, one slot is available only to "people who have never presented before." As it happens, two of the performers — Dennis McSorley and Meredith Gordon — are familiar figures on the local stage. (Gordon also presented at last year's inaugural Open.) Though Jeremy Rayburn has not performed at the Off Center before, he brings plenty of sketch comedy experience, not to mention five other actors. Liam Corcoran, stage name LoKi, is the newbie. Compared with the annual Burlington Fringe Festival, which Roald describes as "more anarchic" and is delivered in 20-minute bursts, the Open is "more focused" and all about allowing performers to "come in and stay a while," she says. Two acts present four shows each week, Wednesday through Saturday. McSorley and LoKi will perform May 30 through June 2; Rayburn and Gordon, June 6 through 9. And, in a gift to theater fans on a budget, each of the Wednesday shows is a pay-what-you-can preview. The 65-seat black-box Off Center, founded in 2010, has always been about nurturing both performers and audiences, and it specializes in works on the edgy side. The Open is clearly aligned with that mission. 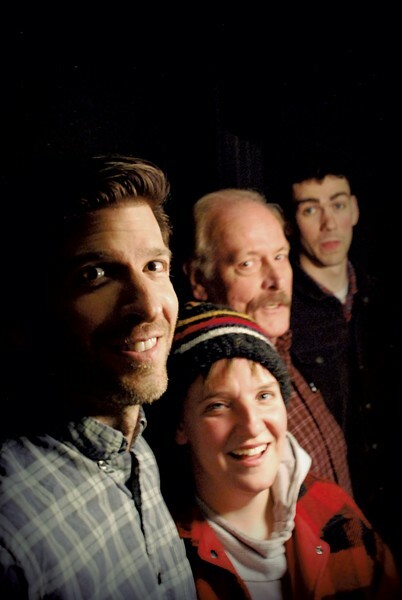 McSorley, a former Off Center board member and "longtime favorite," according to Roald, is the oldest of this quartet and a solo artist with a "Moth"-like storytelling style. Last year at the Fringe, he workshopped a fragment of this year's show, titled "Box of Squirrels." Spoiler alert: It's not really about squirrels. Now an hourlong piece, "It started with the kids in the special ed classes I had in Brooklyn," McSorley says. "It's about being a teacher, the people I met, the people who shaped me." The work features classroom scenes with "the most desperate kids" McSorley encountered in his former career. "It's all about caring for the kids, having respect and, at the same time, fighting a system," he says. "It's a personal story, but it's also universal." It's a calculated choice to pair a retired-teacher/storyteller from New York with a 25-year-old artist-entrepreneur from Monkton who has never performed in a theater setting. LoKi says his 60-minute show is a "coming-of-age story set in Vermont at the turn of the century." The performance is an adaptation of a 2017 musical project in which he wrote and recorded a song about every year of his life for 24 consecutive hours — "chronicling experiences of joy and pain, bullying and romance, dreams and fears, depression and triumph," LoKi writes in an email. "All of the ups and downs of a life are explored through theatrical hip-hop." LoKi describes his show, titled "24 Years in 24 Hours: Growing Up in Vermont," as a musical one — as if Hamilton composer Lin-Manuel Miranda "did a biographical one-man show," he suggests. "I made the music, did the choreographing, [made] simple costumes, props and visual elements." The second week, Rayburn opens with "The Inner Monologue Show," which is pretty much what it sounds like. Along with Brian Park, Katie Hodges, Carl Sonnefeld, Jenna Pacitto and Kailin Farrell, he'll present sketches that revolve around "the inner thoughts of the characters," says Rayburn, who wrote and directs the show. "You get to hear what they're thinking and see how they act." A Virginia native, Rayburn lived in New York City for 10 years and says he was involved in the sketch-comedy scene for six, including classes with the Upright Citizens Brigade. He and his girlfriend relocated to Jeffersonville last year and plan a move to Burlington soon. His fellow actors are "people I've met at the Vermont Comedy Club," Rayburn notes. Gordon closes the Open with her one-woman show "An Evening With Thelma Forbanks." Thelma, whom Gordon calls her alter ego, has appeared previously in five-minute sketches. "But it's going to be fun to give her a whole night of her own," she says, "as I feel like she has always had a killer backstory." The conceit is that Thelma is an aging jazz singer who wants to perform one last time for her fans. Along the way she'll talk about the ups and downs of her career, including "events that dragged her name through the tabloid mud," Gordon explains. "The show is sketch comedy with a dash of drama." A member of the very silly sketch-comedy sextet Potato Sack Pants Theater with her husband, Andy Gordon, Meredith Gordon took recent years away from the stage to concentrate on a new role: mom. Not that she left comedy altogether, as anyone who's seen her occasional Facebook videos can attest. With two young ones safely past toddlerhood, Gordon has reemerged to present brief sketches and even try her hand at standup. "Thelma Forbanks" will put Gordon on familiar ground. "I'm feeling so lucky to be back at the Spring Open," she says, "and at Off Center, my home away from home."